Draft: 2009, Cleveland Indians, 48th rd. Vidal Vicente Nuño...Graduated from Sweetwater (CA) High School and attended Baker University in Baldwin City, Kan...Named the conference's Pitcher of the Year in 2008…Remains the only player ever drafted from Baker University and one of two to appear in the majors, following Zip Zabel of the Chicago Cubs from 1913-15. Posted a career-best 1.64 ERA in 17 games for the Tampa Bay Rays...Tossed more than one inning of relief in eight of the 17 games... Pitched to a 1.04 ERA (3 ER/26.0 IP) with a .200 opp. AVG and 23 strikeouts in those eight outings...Recorded reverse splits in 2018: .189/.263/.311 against right-handed batters and .226/.286/.484 against left-handed batters...Began the season with Triple-A Durham before having his contract selected on May 23...Was on MLB's roster for the Japan All-Star Series following the season. Acquired by the Orioles from the Dodgers for minor league right-handed pitcher Ryan Moseley during spring training…made the Orioles Opening Day roster but pitched to a 6.55 ERA (11- IP, 8-ER) in 8 apps and was optioned to Triple-A Norfolk on April 29…was with the Orioles for two additional stints: May 10-13 and June 16-19…was on the temporarily inactive list from June 25-Aug 17 with oblique, hip and knee injuries…made 3 starts for the Leones del Escogido in the Dominican Winter League. The Totals - Split season with Seattle and Arizona, combining to go 1-5 with 3.74 ERA (37 ER, 89.0 IP) in 35 games including 10 starts. ... With Seattle - Was 1-4 with a 4.10 ERA (34 ER, 74.2 IP) with 62 strikeouts in 32 games including 10 starts. ... In Relief - Posted a 1.91 ERA (8 ER, 37.2 IP) with 39 strikeouts in 25 relief appearances with Seattle (22 G) & Arizona (3)…one of 20 MLB relievers to post a relief ERA under 2.00 (min. 35 IP). ... Starting Things Up - Was 1-4 with a 5.08 ERA (29 ER, 51.1 IP) with 42 strikeouts in 10 starts for Seattle. ... At Safeco Field - Was 1-1 with a 2.49 ERA (12 ER, 43.1 IP) with 40 strikeouts in 17 games including 5 starts at Safeco Field. ... Much-Needed Win - Earned the win Sept. 9 vs. Texas, his first MLB victory since June 27, 2014…snapped string of 44 appearances/20 starts without a win…went 0-11, 3.63 ERA (61 ER, 151.1 IP) over those 44 appearances, including going 0-10 with a 4.17 ERA (53 ER, 114.1 IP) in 20 starts…20-start winless streak had been tied for the longest active streak without a win in the Majors (min. 1 GS in 2015) with Atlanta's Shelby Miller. ... Trade - Acquired along with INF/OF Mark Trumbo on June 3 from Arizona in exchange for C Welington Castillo, RHP Dominic Leone, OF Gabby Guerrero and INF Jack Reinheimer. ... With Arizona - Went 0-1, 1.88 ERA (3 ER, 14.1 IP) in 3 relief appearances with Arizona. • AAA Tacoma - Made one start with AAA Tacoma July 5 at Fresno (W; 6.0,7,4,4,1,6,HR). ... AAA Reno - Opened season with AAA Reno (3-3, 3.38 ERA, 9 GS). Combined to go 2-12 with a 4.56 ERA (82 ER in 161.2 IP) in 31 games (28 starts) with Arizona and New York-AL... Acquired from the Yankees on July 6 for RHP Brandon McCarthy and cash considerations.... His ERA (3.76), home runs per 9.0 IP (1.08), hits per 9.0 IP (7.64) and walks per 9.0 IP (2.15) were lower with the D-backs than with the Yankees (5.42 ERA, 1.73 HR/9.0 IP, 9.92 H/9.0 IP and 3.00 BB/9.0 IP)... Ranked among all rookie pitchers in starts (4th), innings pitched (4th) and strikeouts (9th)...Tied for the Major League lead with 7 "wins lost" with Kyle Lohse and Jeff Samardzija (5 with D-backs in 14 starts)... Finished 14th in the NL with a 1.08 WHIP after Aug. 1, yielding 3 runs or less in 7 of his last 8 starts... Is the first NL Pitcher since the Cubs' Angel Guzman (2006) to go winless in at least 10 starts in a season and first to do so in at least 13 since Stumpy Wiedman with the Buffalo Bisons in 1880 (0-9 in 17 games/13 starts).,, Tied for second on the D-backs with 6 sacrifice hits despite appearing in only 14 games... Tossed 7.0 scoreless innings with a career-high 7 strikeouts in his D-backs debut on July 8 vs. Marlins (3 hits)... Recorded his first career hit on Aug. 23 vs. Padres (single off Andrew Cashner)... Career-high 8.0 innings on Aug. 30 vs. Rockies…retired the final 20 batters he faced. going 0-1 with a 3.20 ERA (19.2IP, 7ER) in five appearances (four starts). Combined to go 10-6 with a 2.54 ERA (138.1IP, 39ER) in 31 games (21 starts) with Double-A Trenton and Single-A Tampa. Led all Yankees minor leaguers in ERA and strikeouts (126) and tied for third in wins. Spent the majority of the season with Trenton, going 9-5 with a 2.45 ERA (114.0IP, 31ER) in 20 starts following his promotion from Tampa on 5/21. Following the season, made 22 relief appearances with the Aguilas del Zulia of the Venezuelan Winter League, going 4-3 with a 2.52 ERA (25.0IP, 7ER). Began the season with Short-Season A Staten Island and went 5-0 with 1 save, a 0.72 ERA (2 ER in 25.0 IP) and 29 strikeouts in 8 relief appearances... Promoted to Class A Charleston on Aug. 1 and in seven starts, went 2-1 with a 1.80 ERA (8 ER in 40.0 IP). Played the entire season with Single-A Lake County, going 6-8 with a 4.96 ERA (52 ER in 94.1 IP) with 94 strikeouts in 21 games (16 starts) for the Captains. Split time between Rookie AZL Indians and Short-Season A Mahoning Valley and went 5-0 with 1 save, a 2.39 ERA (17 ER in 64.0 IP) and 59 strikeouts in 17 games (8 starts). April 2, 2019 LHP Vidal Nuno III assigned to Fresno Grizzlies. February 12, 2019 Washington Nationals signed free agent LHP Vidal Nuno III to a minor league contract and invited him to spring training. November 2, 2018 LHP Vidal Nuno elected free agency. 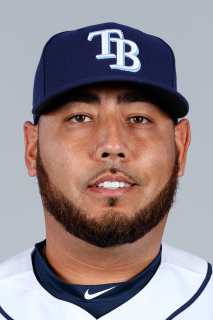 November 2, 2018 Tampa Bay Rays sent LHP Vidal Nuno outright to Durham Bulls. September 1, 2018 Tampa Bay Rays activated LHP Vidal Nuno. August 17, 2018 Tampa Bay Rays sent LHP Vidal Nuno on a rehab assignment to Charlotte Stone Crabs. July 4, 2018 Tampa Bay Rays placed LHP Vidal Nuno on the 10-day disabled list. Right hamstring strain. May 23, 2018 Tampa Bay Rays selected the contract of LHP Vidal Nuno from Durham Bulls. April 5, 2018 LHP Vidal Nuno assigned to Durham Bulls. December 14, 2017 Tampa Bay Rays signed free agent LHP Vidal Nuno to a minor league contract and invited him to spring training. November 28, 2017 LHP Vidal Nuno assigned to Leones del Escogido. October 2, 2017 LHP Vidal Nuno elected free agency. August 23, 2017 Baltimore Orioles sent LHP Vidal Nuno outright to Norfolk Tides. August 18, 2017 Norfolk Tides activated LHP Vidal Nuno from the temporarily inactive list. June 25, 2017 Norfolk Tides placed LHP Vidal Nuno on the temporarily inactive list. June 20, 2017 Baltimore Orioles optioned LHP Vidal Nuno to Norfolk Tides. June 16, 2017 Baltimore Orioles recalled Vidal Nuno from Norfolk Tides. May 14, 2017 Baltimore Orioles optioned LHP Vidal Nuno to Norfolk Tides. May 10, 2017 Baltimore Orioles recalled Vidal Nuno from Norfolk Tides. April 30, 2017 Baltimore Orioles optioned LHP Vidal Nuno to Norfolk Tides. February 19, 2017 Los Angeles Dodgers traded LHP Vidal Nuno to Baltimore Orioles for RHP Ryan Moseley. November 7, 2016 Los Angeles Dodgers traded C Carlos Ruiz to Seattle Mariners for LHP Vidal Nuno. October 14, 2015 LHP Vidal Nuno assigned to Tigres de Aragua. July 9, 2015 Seattle Mariners recalled LHP Vidal Nuno from Tacoma Rainiers. July 4, 2015 Seattle Mariners optioned LHP Vidal Nuno to Tacoma Rainiers. June 4, 2015 Vidal Nuno roster status changed by Seattle Mariners. June 3, 2015 Arizona Diamondbacks traded RF Mark Trumbo and LHP Vidal Nuno to Seattle Mariners for C Welington Castillo, RHP Dominic Leone, RF Gabriel Guerrero and SS Jack Reinheimer. May 26, 2015 Arizona Diamondbacks recalled LHP Vidal Nuno from Reno Aces. May 16, 2015 Arizona Diamondbacks optioned LHP Vidal Nuno to Reno Aces. May 11, 2015 Arizona Diamondbacks recalled Vidal Nuno from Reno Aces. April 5, 2015 Arizona Diamondbacks optioned LHP Vidal Nuno to Reno Aces. October 11, 2013 New York Yankees activated LHP Vidal Nuno from the 60-day disabled list. September 11, 2013 LHP Vidal Nuno assigned to Scottsdale Scorpions. September 7, 2013 New York Yankees recalled LHP Vidal Nuno from Scranton/Wilkes-Barre RailRiders. June 9, 2013 Vidal Nuno roster status changed by Scranton/Wilkes-Barre RailRiders. May 31, 2013 New York Yankees optioned LHP Vidal Nuno to Scranton/Wilkes-Barre RailRiders. May 17, 2013 New York Yankees recalled Vidal Nuno from Scranton/Wilkes-Barre RailRiders. May 14, 2013 New York Yankees optioned Vidal Nuno to Scranton/Wilkes-Barre RailRiders. April 27, 2013 New York Yankees selected the contract of Vidal Nuno from Scranton/Wilkes-Barre RailRiders. February 25, 2013 LHP Vidal Nuno assigned to New York Yankees. October 8, 2012 LHP Vidal Nuno assigned to Aguilas del Zulia. September 3, 2012 Vidal Nuno assigned to Scranton/Wilkes-Barre Yankees from Trenton Thunder. May 21, 2012 Vidal Nuno assigned to Trenton Thunder from Tampa Yankees. May 8, 2012 Vidal Nuno assigned to Tampa Yankees from Staten Island Yankees. May 7, 2012 LHP Vidal Nuno assigned to Staten Island Yankees from Tampa Yankees. April 5, 2012 Vidal Nuno assigned to Tampa Yankees from Charleston RiverDogs. March 23, 2012 LHP Vidal Nuno assigned to New York Yankees. August 1, 2011 Vidal Nuno assigned to Charleston RiverDogs from Staten Island Yankees. May 21, 2010 LHP Vidal Nuno assigned to Lake County Captains from Mahoning Valley Scrappers. July 3, 2009 Vidal Nuno assigned to Mahoning Valley Scrappers from AZL Indians. June 21, 2009 Vidal Nuno assigned to AZL Indians. June 19, 2009 Cleveland Indians signed LHP Vidal Nuno.